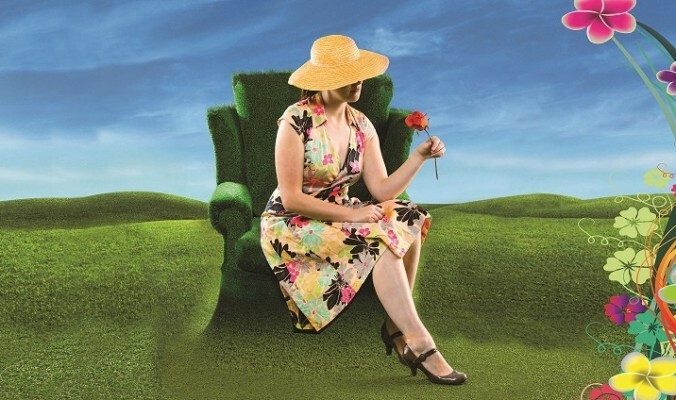 Alan Ayckbourn's journey into the mind of a woman on the verge of a nervous breakdown is a mix of humour and real sadness. It centres on the mind of Susan, a woman past her prime who has realised her life hasn't turned out the way she had hoped it would be. Married to a man who is more interested in writing a history of the parish than in his wife and mum to a son who hasn't spoken to them in two years and then suddenly decides to drop a bombshell, no wonder she finds reality hard to handle. And so she drifts into a land of make-believe where she has the perfect husband, a loving brother and a beautiful daughter who all adore her. While in her real world Susan feels everyone is against her, in her fantasy she is the centre of their universe. As the present becomes more and more chaotic, Susan finds fact and fiction begin to blur until she is no longer sure who she is and what is real. The drama depends very heavily on Susan and Meg Fraser has this fractured woman down to perfection. She even appears like two different characters depending on which world she is in. In the real world her face is harried, she is wringing her hands, her voice is high. And in the fantasy world her face relaxes, she is open to other people and she is calm – at least until the two begin to collide. She is aided by a strong support cast. Richard Conlon has just the right level of understated unpleasantness as her husband Gerald while Andrew Wincott, as fantasy husband Andy, is the absolute charmer – when he wants to be. Neil McKinven is a loveable fool as the dazed and confused doctor Bill – the one person who is actually nice to Susan. There are some classically dry Ayckbourn moments such as when Gerald's sister Muriel, who has moved in to mourn the death of her husband and does not appear in a hurry to leave, cooks up 'burnt Earl Grey omelette'. Or when Susan icily points out how the separation in her marriage is all summed up in two separate beds. Presented by Dundee Rep Ensemble and Birmingham Repertory Theatre, the production is directed with plenty of pace by Marilyn Imrie. Ti Green's designs and Mark Doubleday's lighting help take us back and forth between the two worlds. In many ways it is hard to spot that Woman in Mind was written 30 years ago. There is the odd anachronism (why is Gerald not backing up his book on his computer?) but apart from that the themes of disillusion, unhappiness and a wish for a better life are as contemporary as they were in the 1980s. At The Rep until 28 June, contact 0121 2364455 and Birmingham-rep.co.uk for ticket.